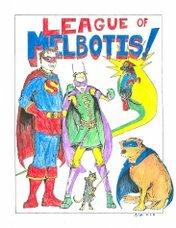 Leaguers, I would like for you to welcome the newest member of The League of Melbotis. Scout came home with us today from the ASPCA. We don't know very much about her, but she's about 1.5 years old, and we understand she's from Bastrop. Taking a look at her makes me believe that she's got some Shepard in her, and most likely some yellow lab. And she seems to have a good, mellow disposition. We need to be patient. She is a kennel dog, and often kennel dogs have funny backgrounds that you need to work with. I don't believe Scout had any kind of particularly tough go of it before she joined us, and it's still the first 24 hours. We've got some work to do with her so that she understands how she fits in here, particularly with Lucy. I am more than optimistic, but I am trying to be realistic about the work that a new dog will take. Scout was, of course, not named "Scout" at the pound. She'd been called "Babette", but it was fairly clear that "Babette" wasn't a name she knew in any way. Jamie and I knew a name would be an issue, and so went back and forth for quite a while prior to actually picking up the dog. I am happy to say, I think we did okay in the end. We won't have a name that I see hitting the top 10 in popular dog names (this is something I find irritating when we take Lucy to the dog park. Do you know how many Lucy's there are? Answer: At least two more, everywhere you go. ), and I don't find it to be too dainty. I confess to a certain concern that somehow things won't work out. Sometimes these things do not. Jamie and I briefly tried to have a dog at one point, and it completely did not work out with our work schedules, lifestyle, and apartment dwelling at the time. And, of course, before Lucy we attempted to adopt, and were never able to bring the dog home because she developed a sudden, grave illness. In short, I really want for this to work, and I think it will. But we can't expect Scout to be Lucy or Mel overnight. So here's to us and what will most likely be a reduction in sleep for a few days while we all get sorted out. Of course, yes, we still miss Melbotis. He's still discussed around here almost every day. But we like being a two dog household, and we hope that Scout and Lucy will work things out quickly. And I still think about Melbotis every time we head to the spillover, the dog park, and when a hundred other things remind you of the guy. We're looking forward to life with our new crew, and I am so happy to have Scout here with us. Well, Scout seems cool. With a bit of guidance and patience I think she'll settle in. Part of what changes with a new dog is the people adjusting to the personality of a new housemate as well. The bigger question is whether Lucy will work out. And things don't look good for Jeff ever really fitting in. He's a loner. A rebel. Congratulations! If Scout proves to be half the match for you that Holley has been for me, you and Jamie will be lucky folks, indeed. Adopting is always a gamble, a mystery, a leap of faith. Not infrequently, though, some of the best things in life are. She's lucky that y'all found her! Congratulations on the addition to the family! Our dog, Truman, was adopted and he was a bit nervous at first, but he is by far the best dog I have ever had. She is SO cute! I'm excited to meet her at Thanksgiving...a little disappointed that you didn't name her "Ursula Nutt" in honor of Jamie's foremother, but excited all the same. Hey Guys, Scout has the official approval of Karebear and The Admiral. She's cute. oh, we're saving "Ursula Nutt" for your firstborn child. Thanks for all the support, guys. We have some work to do, but its in areas that are delightfully body-waste free. My wife and I had a similar experience after our dog Seamus passed last year. We waited for almost a year because we knew that if we started looking too soon we would be looking for "Seamus" and that would not be fair to the new dog or to us. We eventually got our new dog, Vincent, this past November and we are very happy. Good luck with Scout and I hope everything works out.